MIGNONNE: refinishing furniture is recycling, don't ya know?! refinishing furniture is recycling, don't ya know?! as you can probably tell by now, Mignonne is a big fan of refinishing and repurposing furniture. not only is it a wonderful creative outlet for Johnelle, it serves a purpose in the community - supporting sustainability efforts. * reducing the amount of trees harvested for new furniture ... this conserves natural resources and energy! * reusing existing furniture means one less item in a dump or landfill somewhere! 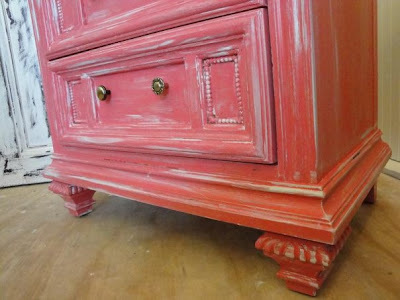 * recycling by refinishing a piece, transforming it into something new and usable again! okay, those are all worthwhile contributions. but when you purchase a vintage piece at Mignonne, you can also satisfy your desire for beauty and chic in your living space. Johnelle's art background and flair for customizing furniture means you will have a uniquely beautiful décor piece for your home. Johnelle can do a custom project for you, whether it is on a furniture element you already have, seeking out a special piece for you, or personalizing something we already have in stock. Give us a call or stop by the store to discuss further ... and get on board for doing your part to green up our world! Yes, I know. In fact by refinish, we give a new life to our furniture. Refinishing give new strength to a furniture. This is a good post.But I love a well decorated and furnished home that's why I found a place to get a stylish and discount bedroom furniture for my new home.